If you’re wondering “what are the best dog beds for labradors,” don’t worry, I’ve got you covered! Buying a dog bed is harder than it seems, especially with so many great choices out there! It doesn’t help that some of them are kind of pricey, so you want to make sure you’re getting the best bang for your buck. Today, we’ll talk about the features that you need to look for when you’re picking a bed. Then, I’ll share my top five picks! 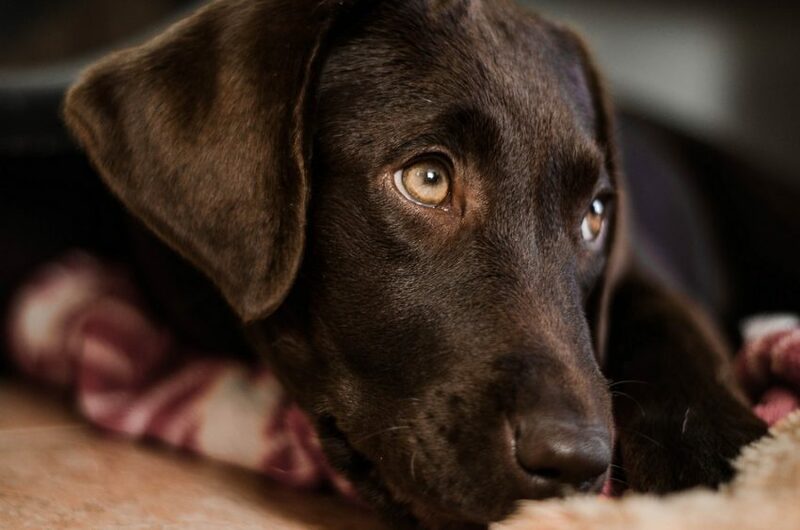 Before we can choose the best dog beds for Labradors, it’s important to understand a few basic facts about the breed. I’m not going to go into a ton of detail, but rather give you a quick recap of their traits that most pertain to their dog bed needs. Obviously, the first trait you should consider is their size! You don’t want to get a bed that’s too small, after all. 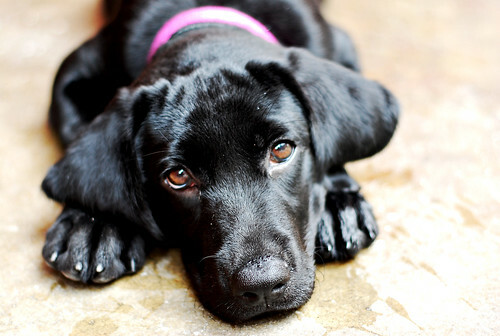 Labs average between 55 to 80 pounds, and measure about 21-24 inches from foot to shoulder. They’re considered large breed dogs, so take that into account when searching for a bed. Look at beds that can hold the higher end of their weight range, just in case. However, don’t assume that any “large” bed will do. You need to look at the measurements and weight restrictions, because every brand has different size standards. What on earth could a lab’s brain have to do with a bed? Well, if you’ve ever had a bored high-energy dog, you already know the answer! I’ve had labs, and I’ve had very active dogs (my Pharaoh Hound didn’t get the memo that she’s supposed to be a couch potato). I can tell you from experience that bored dogs chew. Everything. Including their beds! Even if you have the most well-trained lab on the planet, I still recommend going with something that can withstand a bit of gnawing. If you’re thinking, “Now I know she’s reaching! What does socialization have to do with a dog bed? ?” don’t worry, I’ll explain myself. Labs are incredibly friendly and outgoing dogs who love to be with their families, so you’ll want a bed that easily fits into the room where you spend the most time. You don’t want something so big that it only fits in a bedroom off the beaten path. When I had my lab/collie, we choose dog beds that could be moved from room to room because she went where we went. While my labs never shed quite as much as my German Shepherd, they still lost their fair share of fur during shedding seasons. Labs are also outdoorsy animals, which means they’re prone to getting very dirty very fast. Unless you love the idea of spending oodles of time cleaning your dog bed, you’ll want to look for something that repels dirt, dander, and fur. 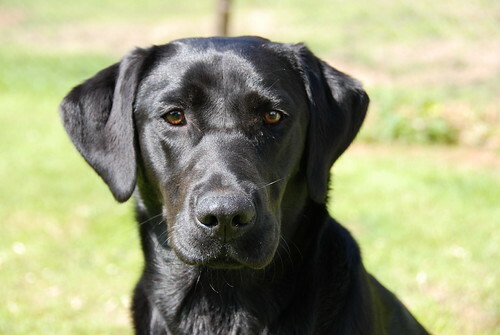 Labs are prone to certain bone and joint disorders like hip dysplasia and osteoarthritis. While most of these disorders present later in life, you can take preventative measures now by getting them a bed designed to support their bodies. You don’t need to go crazy with an expensive orthopedic dog bed right off the bat, but opt for something a little better than a thin mat, especially if you have hard floors. Supports your lab’s bones and joints. Now that we know what to look for in the best dog beds for Labradors, let’s check out some of my top picks (along with reviews). I have so many favorite dog beds that it’s hard for me to narrow down my list to my top five favorites. However, it wouldn’t be really helpful to you if I gave you a list of 50 beds, now would it? So, just for you, I dug really deep down and picked the top 5 beds that I have or would buy for my own lab. Take a peek at the table, then read on for more in-depth reviews with the pros and cons for each one. DogOnIt OMG Bed Best all-around bed. Chew-resistant, orthopedic, and comes with a lifetime warranty. 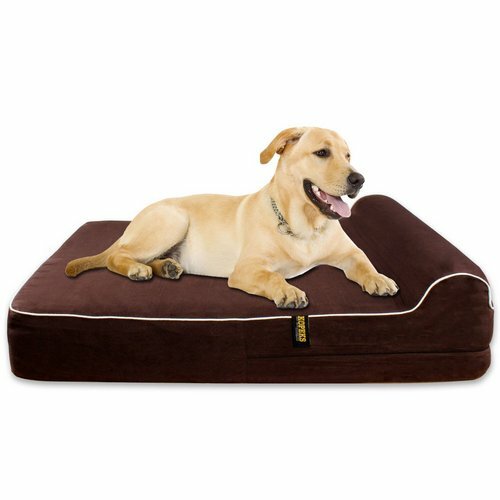 KOPEKS Orthopedic Memory Foam Dog Bed Budget-friendly, great bone & joint support, hypoallergenic foam. Big Barker Pillow Top Orthopedic Dog Bed Made for large dogs, great support, made in the USA, 10-year warranty. All-Aluminum Kuranda with Heavy-Duty Vinyl Chew-proof, super sturdy, can be used indoors or outside. 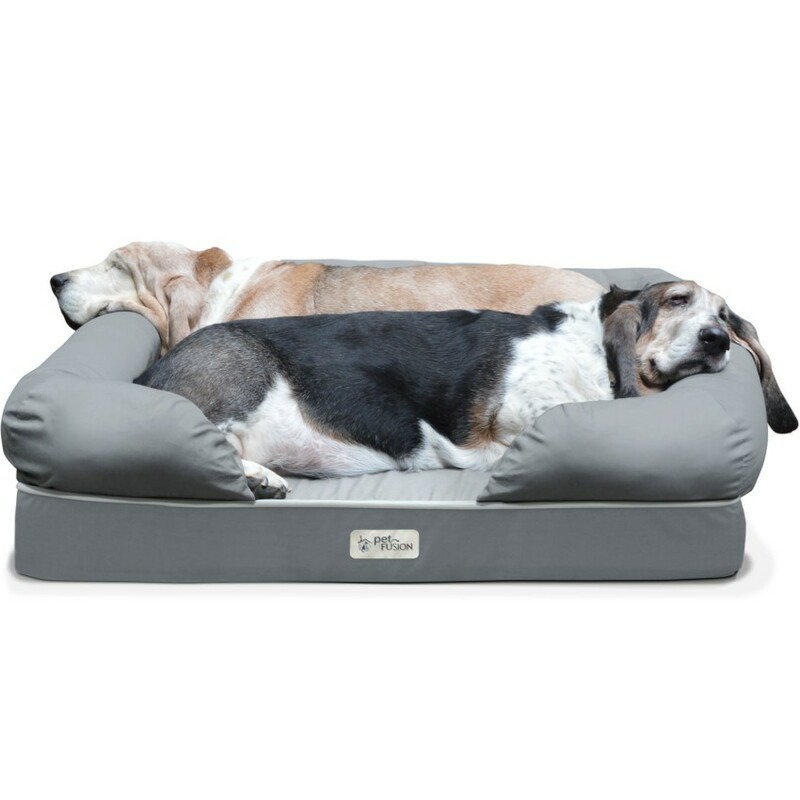 Pet Fusion Ultimate Dog Lounge And Bed Premium memory foam, couch-like bolsters, gentle on their skin. The OMG Dog Bed by DogOnIt is always my #1 pick across just about any bed category. I’m not going to lie, it’s a bit on the pricey side, but it’s absolutely worth every penny. If your budget allows for it, you can stop searching for the best dog beds for Labradors right now and just go buy this one! Need a little more convincing? Let’s check out the pros and cons! The OMG is made to hold up to a whopping 300 lbs, so your Lab will definitely have no problem fitting on this bed! It has three layers of memory foam to support your dog’s bones and joints. The upper gel memory foam layer helps keep your Lab cool in the summer. It’s eco-friendly, Made in the USA, and Certified Non-Toxic. Comes with a machine-washable removable cover and industrial-strength zipper. The ONLY real drawback to this bed is the price. The large, which should be fine for your Lab, will run you over $400. If you opt to go for an XL, expect to pay an additional $100. Like I said, I feel it’s totally worth every penny, but for those on a tight budget, the price tag could put it out of reach. They do have other beds aside from the OMG, though, including a lower-priced memory foam orthopedic bed. It’s not quite as thick as the OMG, but still very nice! If the DogOnIt bed is out of your price range but you want an orthopedic bed, check out the KOPEKS Orthopedic Memory Foam Dog Bed. This great bed for labs comes highly recommended by customers! While it comes in three sizes, you’ll want to go with the Jumbo XL. Topped with a soft & snuggly machine-washable micro-suede cover. Comes with a water-resistant removable liner beneath the top cover. Filled with 100% orthopedic grade hypoallergenic memory foam. Anti-slip rubber bottom keeps it from sliding all over the place, which is fantastic when you have an energetic Lab! The “large” is kind of misleading, since it’s better sized for a medium dog. You’ll need to go with the jumbo XL instead. Some users complain that urine still leaks through. I’d say it’s more water-resistant than water-proof. Unsure of where it’s made. They do not disclose this information on their Amazon listing or their website. As a “big dog” mom, I love the fact that Big Barker specializes in large breed beds. Aside from their Barker Junior, all of their beds are designed for dogs 50 lbs and up. I covered a lot of their features in our complete Big Barker dog bed review, but here are some highlights. Memory foam that’s calibrated specifically for large-breed dogs. It’s actually too powerful for small dogs! 10-year warranty that guarantees the bed won’t flatten like a pancake. Make in the USA and meets CertiPUR-US standards. Big Barker donates beds to vet hospitals, military service dogs, rescues, and more. While not so much a pro about the bed itself, I love a pet company that gives back! The price is a smidge high for my budget. The smallest size (a large) still comes in at over $200. Not the most expensive bed on this list, but still a bit pricey. Doesn’t come with a waterproof liner. You have to buy it separate, and it’s not cheap. If your lab is on the low-weight end of the spectrum, it might be a bit too much bed for her. If you’re strongly considering a Big Barker but need a little something to tip the scales completely in their favor, I recommend reading their About page on their website. It’s proof positive that this company is driven entirely by a desire to make dogs’ lives better. Very heartwarming, too! If your Lab is an aggressive chewer and you’re okay with an elevated dog bed, you’ll want to check out Kuranda. We just talked quite a bit about this bed in my recent Kuranda dog bed review, so I suggest checking that out for more details. 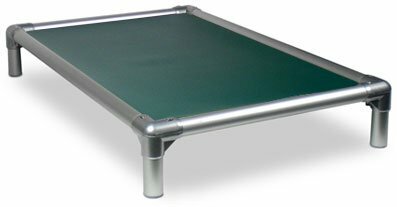 The most “chew-proof” bed on this list (as long as you get the aluminum frame with the heavy duty vinyl). Allergy-friendly materials are great for Labs with sensitive skin. The elevated design helps keep your Lab cool all summer long. Super easy to clean: just hose it off! Kuranda sells inexpensive replacement parts. Aside from the fabric replacement, most parts are just a few bucks. Only comes with a 1-year warranty. Kind of tricky to assemble. The heavy-duty vinyl is the only fabric option that is chew-proof. Not a major con as long as you’re careful to buy the right style. The height isn’t adjustable. You can request a different length if you call their customer service before ordering, though. Prefer a bolster-style bed with sides? The PetFusion Ultimate Dog Lounge is a great affordable choice. While the Large is theoretically big enough for a Lab (it holds up to 100lbs), if you have extra room in your budget, I think the XL is a better fit (literally). One of the most budget-friendly beds for labs on this list. Highly rated by users on Amazon and Chewy. Made with 4″ memory foam to support your dog’s joints. Removable and machine-washable bolsters make the bed easy to clean from top to bottom. Made in China, but PetFusion claims that the factories undergo “rigorous quality assurance checks” to meet their high standards. Multiple complaints that the cover and the zipper aren’t very durable. Cover is water-resistant, NOT water-proof. That means urine or spills can leak through and ruin the bed. Cover is also tear-resistant, NOT tear-proof. To be fair, nothing is tear-proof aside from concrete, but still, I see a lot of complaints about how easily the cover comes apart. If money was no object, I’d definitely go with the OMG Dog Bed from DogOnIt. It’s just an extraordinary bed. I think it’s nicer than my own, and I have a really terrific mattress! My second choice is the Big Barker. Not only is the bed just awesome, but I also love the company’s background and charitable work. Didn’t fall in love with my top five picks for the best dog beds for Labradors? Don’t worry, there are plenty of other great beds to choose from! The 5 Best Fully Machine Washable Dog Beds– perfect for really messy dogs. 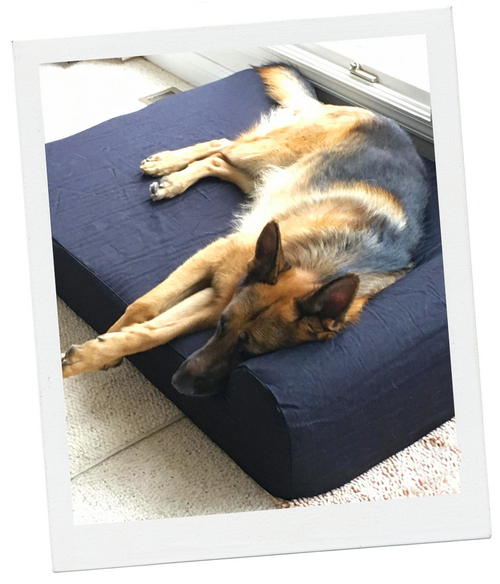 12 Best Dog Beds for German Shepherds– if it can hold up to a GSD, it can hold up to a Lab! 10 Best Hypoallergenic Dog Beds and Blankets– for Labs with allergies. Remember to follow my tips for things to consider and features to search for, and you’ll be just fine! 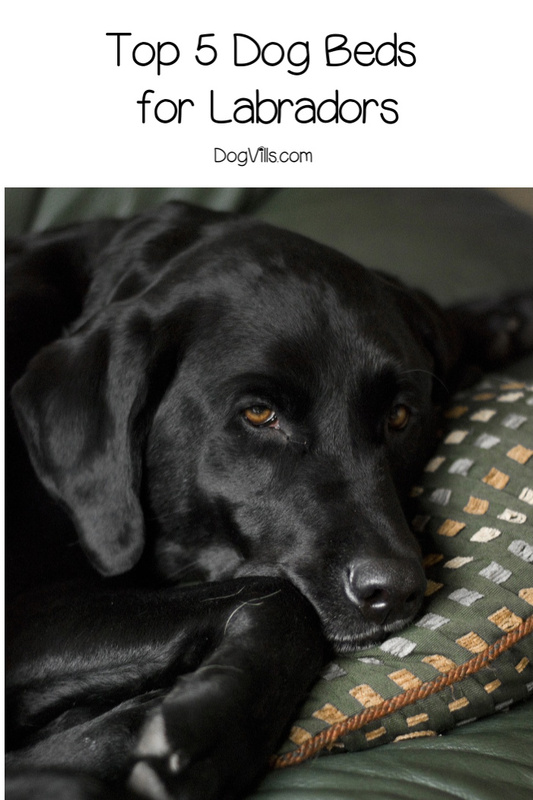 Do you agree with my picks for the top 5 best dog beds for Labradors? Would you add another bed to the list? Share your thoughts below!